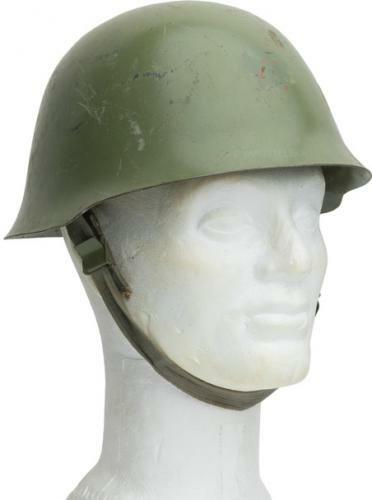 The good old Yugoslavian/Serbian steel helmet M/59: the shell is like a deformed Wehrmacht steel pot, liner copied from the Americans and the colour looks distinctly Soviet style - when you take something from all of the major players you end up with something utterly beautiful! 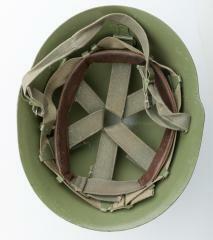 Adjustable for "every head size". 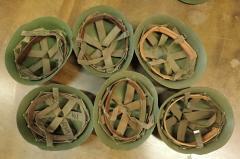 Some have a "JA" or red star emblem on the front, some are less conspicuous. Clearly used, probably for dirty deeds. They are still intact for the most part, but don't expect perfection. We would like to say here's a nice cheap steel pot, but they're not nice at all. Not sold for real protective purposes, only for show. The liner and headband adjustment is a bit stiff and takes some figuring out but should go down to about 54-55cm and I reckon would probably expand out to circa 60cm. I even got a nice red star on the front. I received a well used helmet with a sticker style Yugoslavian emblem on the front. Also came with original manual sheet on how to adjust the helmet. Easily the best 10$ I've ever spent! 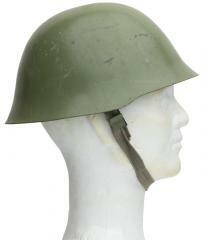 Pretty basic, but pretty solid steel helmet for a great price, if you don't mind that it may have possibly been used during one of the less pleasant times in modern history. The one that I received has definitely seem some use of some variety with a fair few scratches and other signs of wear in outer part of the helmet. As well, mine was one of the ones that was painted over, but the red star is still partially visible. The liner is not quite as comfortable as an US M1 Helmet liner, but it is still fairly comfortable and easy to adjust once you figure it out (the adjustment is a bit stiff to start out). 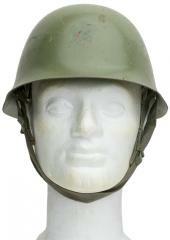 All in all, with the good price for the helmet ($12 CAD), I would definitely recommend this to anybody looking for a steel helmet to add to their collection. Mine is almost unissued. A little wear on the leather part of the liner and a few scratches in the paint, but other than that it looks brand new. It came with a red star decal on the front. I definitely recommend this for the price. At $12 CDN you can't go wrong. Tuli punaisen tähden kanssa, hiukan naarmuja mutta hyvässä kunnossa. Erittäin helppo säätää ja henkilökohtaisesti käyttäisin tätä mielummin kuin intin kypärää. Sisäpuolella on edellisen käyttäjän kirjoituksia, olisi hauska tulkata ne. Mukana oli myös alkuperäiset ohjeet. Paras ostos varustelekasta. This is a nasty helmet, with more than a little rust and wear on the liner, but at 10 euro and the fact it's a nice enough piece is good enough motivation to buy one while you can.